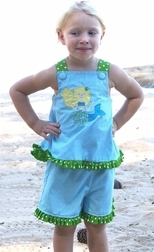 The adorable dress/swess top (2 inches longer than a regular swing top) and trousers set is made in the "Calli" style in turquoise gingham. 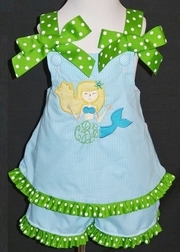 The shoulder straps and ruffle around the bottom of dress/top are made of green with white dots grosgrain ribbon. 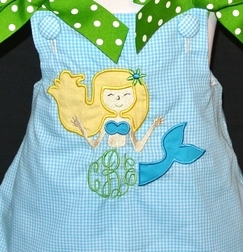 The front is appliqued with our new, exclusive mermaid whose tummy is your little one's monogram!